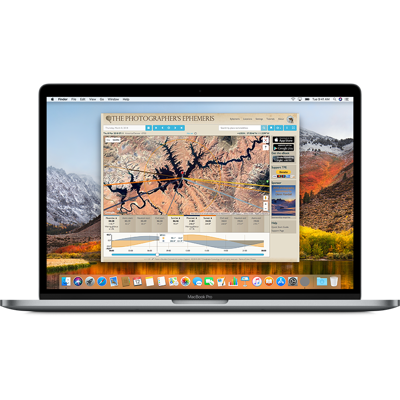 The premier app offers a rich set of planning tools for landscape, cityscape, outdoor, architectural and night photography. TPE helps you plan outdoor photography in natural light. See how the light will fall on the land, day or night, for any location on earth. 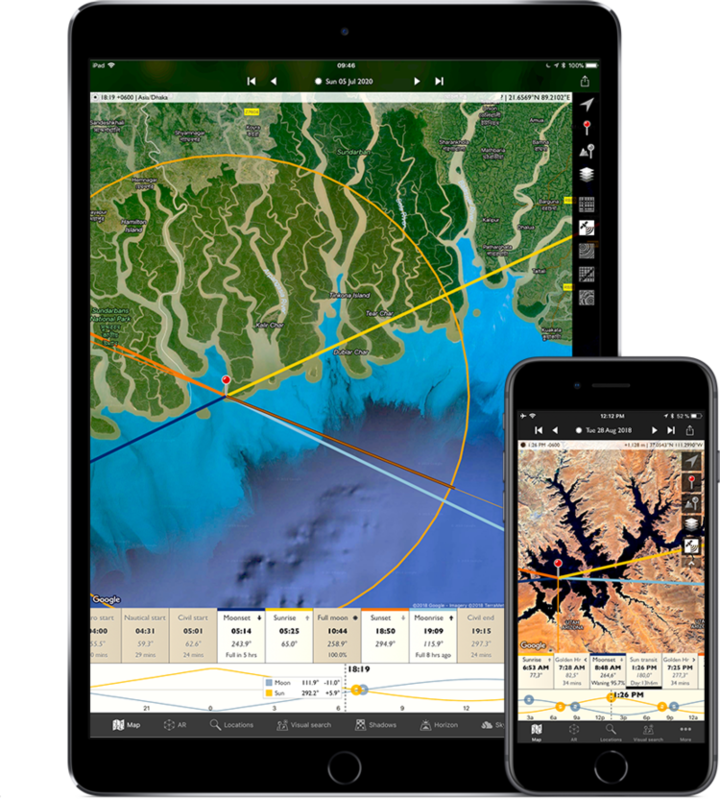 Night mode, Augmented Reality, line-of-sight analysis and visual search support the most sophisticated photo planning needs. Use TPE’s AR page, built on Apple’s AR Kit for a “through-the-lens” simulation of sun, moon, milky way and stars directly on your device. AR is ideal for checking alignment while in the field. Paths show you where the sun or moon will be at any time past or future. Calibration and adjustment are quick and easy. Haptic feedback (vibration) and horizon and twilight altitude lines let you know when the sun or moon is rising or setting. Night mode features a 3D representation of the Milky Way, pole stars and major constellations directly over the map, so you can easily visualize how to align your shot. The night mode overlay is a true 3D graphic representation of key elements that matter to wide-angle night sky photographers. When you rotate or tilt the map, the night mode overlay moves too, giving a unique perspective for shot planning. Tap a star to see its common name, Bayer name, azimuth and altitude. Relative magnitude and colour (BV-index) determine the star’s appearance. Research and save your own list of favourite photographic locations, using seven different map types, including two offline maps, and save them in your locations list. You can choose between using Apple or Google Maps depending on your preference and local coverage quality. Show your favourite locations right on the map and navigate to them with a single tap. 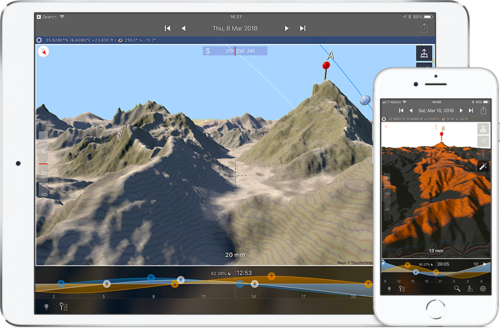 The Geodetics feature lets you check the sightline between camera and subject, showing where the sun or moon will lie relative to a mountain summit or ridge line. You can determine when the sun or moon will rise from behind nearby hills and mountains. Visual search can tell you in one tap the exact dates and times when sun or moon will align with your subject. 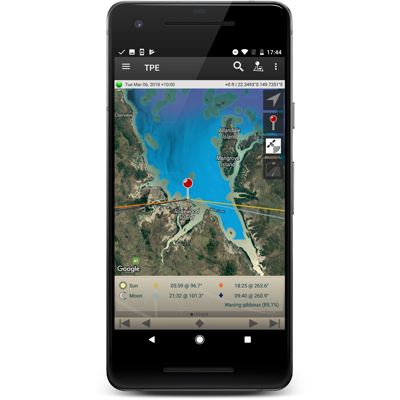 Sunrise/sunset color forecasts are available with a subscription to the Skyfire service, available via in-app purchase.